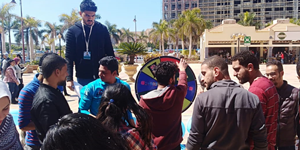 Infinity Club held an orientation day on Tuesday, 19 March, 2019. This was held from 12.30 pm to 2.30 pm at the Humanities Building. About 30 of the club members managed the coordination of the event and introduced the attendees to its activities. The day also included other leisure activities like bouncing on balloons and playing chess.